It’s an Internet note taking, collaboration and task management solution – and a beautiful one at that. I recently gave a recommendation for Diigo as a very useful and well done internet product. Here now a second recommendation for a service that it’s worth looking at – even though you’ve probably never heard of it and it’s not coming fom any of the big Internet Companies. Notion.so wraps together what is often spread around in an array of different services. Like with the Swiss Army knife approach: if you’re such a pro that you MUST have EVERY conceivable feature for a specific task, you probably better stay with the specialized services. I’m using it more for note-taking and structuring ideas and projects plus the subsequent follow up. 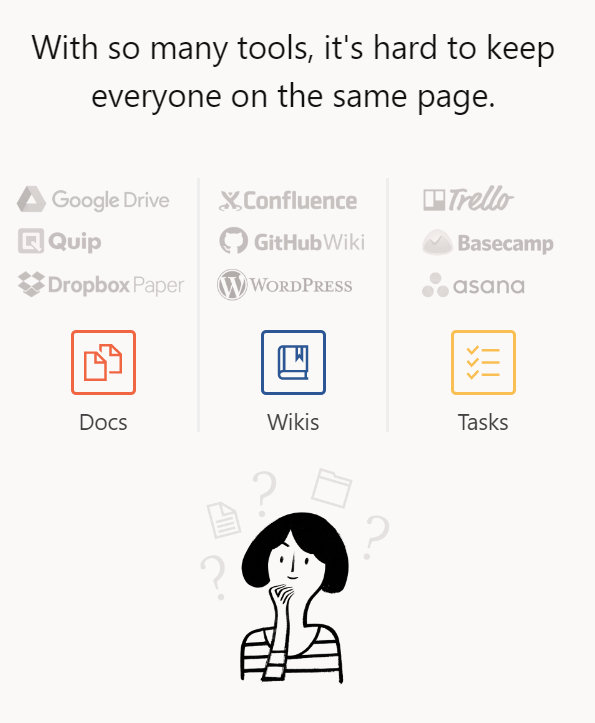 In this respect, it rather replaces OneNote, Evernote or asana for me than the apps & services mentioned in the picture. Not so important for me, but interesting to know: integration with other tools like Trello and Slack…. So obviously targeting an IT-savvy audience.